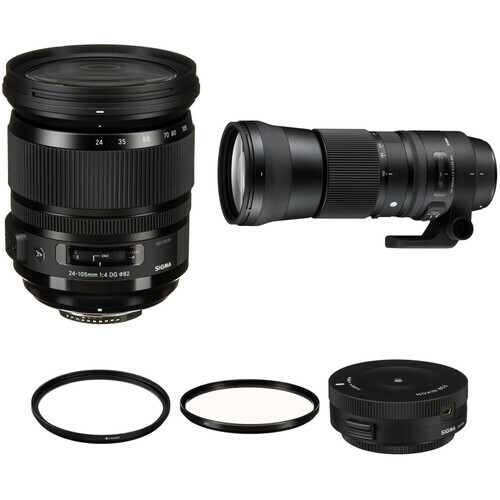 Bundling a versatile pair of Nikon F-mount zooms, the Sigma 24-105mm f/4 and 150-600mm f/5-6.3 Lenses Kit from B&H includes the wide-to-short telephoto Art-series lens and the tele-to-super tele Contemporary-series lens with 95mm and 82mm Protector filters and a Nikon F-mount USB Dock for fine-tuning the image stabilization and focusing settings, as well as updating the firmware, of these lenses. The Sigma 82mm Protector Filter is a simple, clear filter with a 1x filter factor and is designed to provide general protection for your lens. This optically clear filter does not affect overall image quality while helping to prevent dust, scratches, moisture, and other elements from reaching or damaging your lens. This filter is multi-coated which helps to eliminate internal ghosting and reflections. Sigma Protector filters are constructed from optical glass with a black rim. Set within an aluminum-alloy filter ring that is durable while remaining lightweight, the glass provides increased clarity as well as color fidelity while the black rim further ensures that reflections do not occur along the filter's edge. Slim, aluminum-alloy filter ring helps to prevent vignetting and is durable while remaining lightweight. Box Dimensions (LxWxH) 4.646 x 4.646 x 0.787"
Box Dimensions (LxWxH) 4.8 x 4.2 x 0.8"
Box Dimensions (LxWxH) 4.7 x 3.8 x 2.2"
24-105mm f/4 DG OS HSM Art Lens for Nikon F is rated 4.6 out of 5 by 81. Rated 5 out of 5 by Cape Cod Don from A stands for Awesome ! Sigma says the A medallion on this lens denotes it as being in the new ART series. I could argue that it also could stand for Awesome. 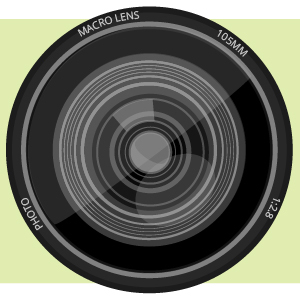 Cosmetically the lens exhibits a very modern appearance, similar to the recent Zeiss lenses. Optically it is excellent, a great match to my Nikon D800. The detail in the pictures at 100x is the best of any of my lenses. The focus was dead on right out of the box. The zooming ring has a slight resistance but is extremely smooth, not a hint of chatter. The wait was long for the Nikon release of this lens but definitely worth it. Rated 5 out of 5 by Ronald from Outstanding Lens Since I've always used Nikkor lenses in the past, I spent a great deal of time comparing the Sigma 24-105 to Nikon's 24-70 and 24-120. Since purchasing the Sigma lens, I've been on 2 major trips and taken well over 3,000 photos. In analyzing my pictures, my satisfaction and confidence with this lens continues to grow. Outstanding clarity throughout the range. Solid feel on my D610. Heavier, yes, but I expect a great lens to be so. Please, Sigma, continue to produce quality lenses. I'm now fully open to using 3rd party gear. Rated 5 out of 5 by David from The perfect walk around lens for FX This lens is sharp. It does have it's issues like all zoom lenses do but in reality it handles them better than most. I looked at all of the lenses in this category as well as those in the 24-70mm range. I narrowed the group down to the Sigma 24-105 and the Nikon 24-120, and though I have beeb a lifelong Nikon user the bottom line was that the Sigma out preformed the the Nikon glass. I would buy this lens again. The Sigma build quality is first rate. The lens is heavy but that just keeps me in shape with all the other glass in my backpack. I also own the Sigma 12-24mm f/4 as well. Rated 5 out of 5 by Egill Bjarki from Decent For what it is, an all around, cost effective lens covering a wide focal range, it is quite decent. Not sure it deserves the Art label compared with the other uncompromising lenses in the lineup though.I like to use this lens for mostly video. For photos, preferably, I use either the 35mm or 50mm Art. When the situation I am working in does not allow me full control, I grab this lens.There has been much talk about a future super wide and all around Art lenses. I will not be interested in them if they do not surpass this lens significantly. This lens is what it is, very comparable with it's Canon/Nikon counterpart, but slightly better, especially in the centre. Rated 4 out of 5 by gcubed from A real pleasure! First of all, the equipment is better than the photographer. I am still enjoying the learning process for what will aways be a hobby for me. I use this primarily for outdoor photography on a Nikon d750. I have been very pleased with the images. The lens is easy to work with outside and I have no problem carrying it around through all kinds of terrain. My only complaint is I see the edges of the lense hood when I shoot at 24mm. I don't like having to take the hood off for wider angle shots. Otherwise, this is an amazing product. I attached a photo of me hiking ancient dunes from Lake Aggasiz because I took the shot using wifi from my phone. Obviously, very good range! The lense seems to be very sturdy and focuses quickly. Rated 5 out of 5 by Nikondude from Excellent Performer Excellent image quality across the zoom range. I compared test images shot with quality zooms and primes like the Nikon 70-200 f/4, 85 f/1.8d and 50 f/1.8g and the Sigma has very similar IQ and no significant weaknesses. I find the images quite good shot wide open to the corners on an FX sensor. The weight and size of this lens may deter some photographers, it is a handful. Focus and zoom rings move smoothly though they have more resistance than most lenses I've used. The output looks consistently very good, the optical stabilizer is excellent, the focus is fast and accurate, and the build quality is top notch. When i absolutely need a fast aperture lens I'll have to go back to a prime but for the other 90% of the time I'll have no regrets using this lens. Rated 5 out of 5 by Tav from A must-have wide-angle! I needed a cheap wide angle zoom since I shoot a lot of volume as a freelancer so I could reserve my Nikon 24-70 for weddings only. As it turns out, my freelance client told me that my image quality has improved! This lens spanks Nikon's 24-70 at every turn - except that it's only f/4. But honestly, if you're shooting wide angle, do you really want a shallow DOF? In addition, it focuses FAST and accurate in dark wedding venues. I have very few instances of soft or back focus issues. Certainly less issues than the 24-70. Portraits shot at 105mm at f/4 look fantastic, but the bokeh isn't as creamy as it would be with 2.8, but with the 24-70 set to 70mm, 2.8, it wasn't that creamy either. You want creamy bokeh? Get an 85+mm prime with 1.4. If you want a great all-around workhorse, get this lens. People complain about the weight. It's heavy, yes, but it's a professional lens built with professional quality. Weight isn't a valid complaint. Rated 5 out of 5 by Gordon C. from Worth the investment! I been using this lens for 3 weeks of doing portrait's and landscape's on my D750 with battery grip, it's handling was not cumbersome. Being able to use the constant f/4aperture at all focal length's adds more creativity prospective that I did not have before. I found the focus speed fast on indoor & outdoor lighting conditions with no seeking so far and the OS works without interfering your shooting. This sigma lens has a solid feel & the designed performance point gives smooth manual focus & no lens creep! I had considered nikon 24-120 lens, but given the FX / DX on the camera side plus the crop factor one can get to around 120 in view angle if need be. The Sigma 24-105mm F/4 is weather sealing ? The Sigma 24-105mm f/4 is not weather sealed. OS stands for Optical Stabilization. Hi I am planning to buy a nikon D610. Does the sigma 24-105 f/4 lens go well with this camera. Have you guys tested this combination before. Is there any cons while using a third party lens with nikon compared to nikkor lenses? is there a gasket at the body mount? I don't see why not. It's a Nikon lens for a Nikon camera. I'm using it on a Black Magic Pocket Cinema Camera so I'm probably the wrong guy to ask. is this lens good for portraits? I'm considering this lens for use with my D810. When I transport camera/ lens or carry in car, I like to put the Nikon CV-DC4 (ever-ready style) protective leather case on it to insulate from scuffs and scratches. That case does NOT fit (barely) with camera and Nikon 24-70 lens attached. Noting that this lens is shorter, do you know if D810 and this lens will fit? Don't know, but it is a pretty hefty lens. If a 24-70 doesn't fit, I find it unlikely that a 24-105 will. Another followup to the other question: Will the aperture of f/4 give a different DOF on a crop senor, and if it does, what would be the equivalent on a DX lens?